Last minute reservation discounts, contact us! We will be happy to receive your requests by mail info@croatiarab.com ! Apartments for 2, 3, 4, or 5 persons, in a beautiful private owned house, situated on the island of Rab - pearl of the Adriatic. Appartements - Kroatien - Rab, Ferienwohnungen in einem Privathouse. Appartements für 2,3,4 oder 5 Personen in einem wunderschönen Privathaus auf der Insel Rab, der Adria-Perle in Kroatien. Saját tulajdonú apartmanok 2, 3, 4 vagy 5 fő részére az Adria gyöngyszemén Rab szigeten. Apartmani za 2, 3, 4 ili 5 osoba, u prelijepoj privatnoj kući na biseru Jadranskoga mora, otoku Rabu. Apartments in private houses on the beautiful Island of Rab, Croatia. Vaccation near sea, sand beaches and old city of Rab. Information about Island, pictures, private apartments, MTB routes and models of old ships from Rab. Apartmani u privatnim kućama na prekrasnom otoku Rabu u Hrvatskoj. Odmor u blizini mora, plaže i stari grad Rab. Informacije o otoku, slike, privatni apartmani, biciklističke staze, i modeli starih brodova otoka Raba. Wir bieten Ihnen gemütliche Unterbringung in unseren Appartements für 2,3,4 oder 5 Personen in einem wunderschönenPrivathaus auf der Insel Rab, der Adria-Perle. Accommodation in Croatia Rab. 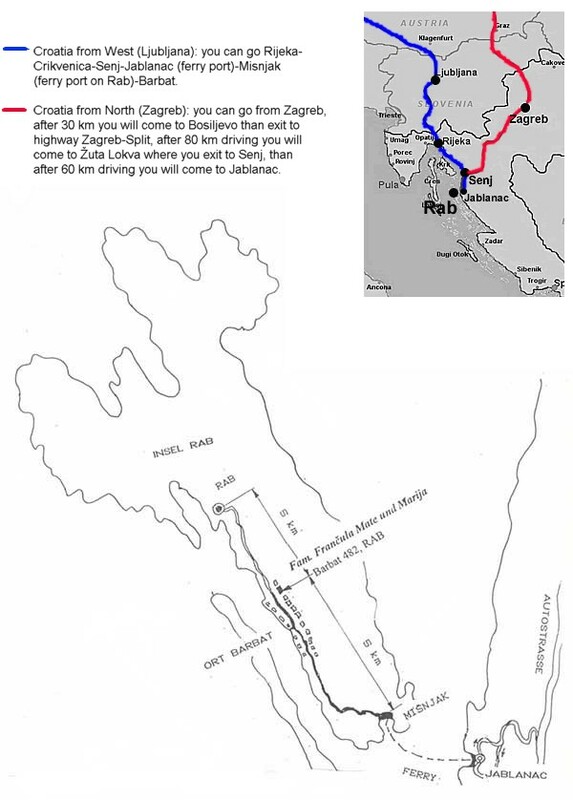 MTB routes on the Island Rab. Apartments on the Island of Rab. Holiday in Croatia, sea Adriatic. Beaches, travel in Europe, Holidays. Ferienhaus und Ferienwohnung in Insels. Rooms, Zimmer, Ferienhaus, Appartements, Urlaub in Kroatien. Adriatic Strande Kroatien Urlaub. Ferienwohnung und Ferienhäuser. Apartmani na Otoku Rab. Odmor na otoku, Sobe i Smještaj Hrvatska. Croazia Vacanza. Camere e Appartamente. Isola di Rab. Lopar i Supetarska, Vacation.